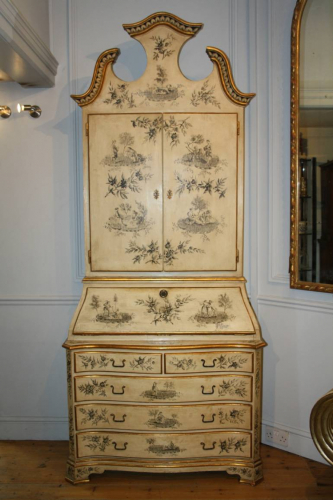 Charmingly elegant this wonderful cream, gilt and hand painted Toile de Jouy bureau cabinet is so pleasing on the eye and gorgeously decorative. With a pierced swan neck cartouche, it also has a wonderful red painted interior. The middle section opens to reveal a writing table as well as drawers and note holes. The top section has adjustable shelves whilst the lower half drawers. Hand painted scenes of couples in landscape. The design has been taken with reference to the Regency period but this Florentine, Italian piece is later c1930`s. If only I could fit it in my home......!